It’s not always easy to come up with alphabet activities for younger kids who have no prior letter knowledge. Exposing preschoolers to letters of the alphabet without the stress of a correct answer or desired outcome is a fun way to begin learning the alphabet. 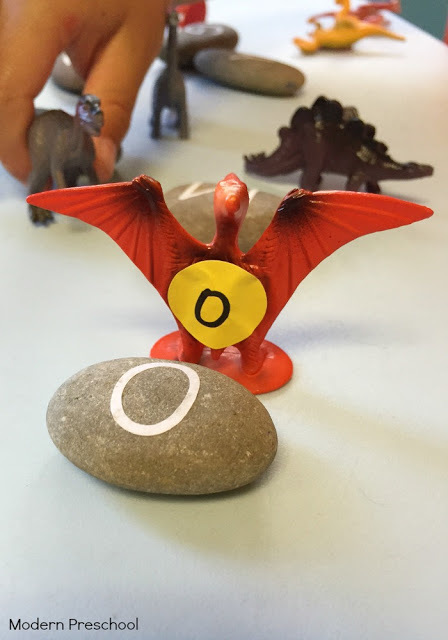 Our dinosaur egg alphabet match can be set up for young children to play different ways to fit their individual learning needs. To set up this activity, you’ll need just a few supplies. Gather 26 smooth, flat rocks to use as dinosaur eggs. Wash any excess dirt off of them and let them dry. On our rocks I used vinyl alphabet letter stickers. You could also use scrapbooking letter stickers or just write the letters on the rocks with a Sharpie. The dinosaurs we used in this activity were from a set of all different sized dinos. My preschoolers call these the babies. It does not matter what size dinosaurs that are used though. If you can’t find a set of small dinosaurs, use whatever size you can find! I used the circle stickers that you can find in the office supply aisles to add letters to the dinosaurs. Simply write one letter of the alphabet on a each sticker with a marker. Apply one sticker to each dinosaur. Now that the dinosaurs and the rock eggs are prepped, it’s time to play – and learn! For kiddos who are not yet mastered the uppercase letters of the alphabet, start this activity with just the letters in your child’s name. Slowly increase the amount of dinosaurs and rock eggs as confidence builds. Practice saying the names of the letters on the rocks and dinosaurs. 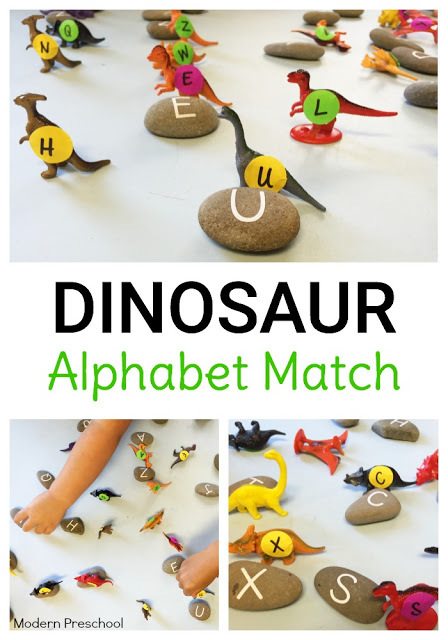 Ask questions about what the letters look like, and if your child can find the matching egg for the dinosaur. 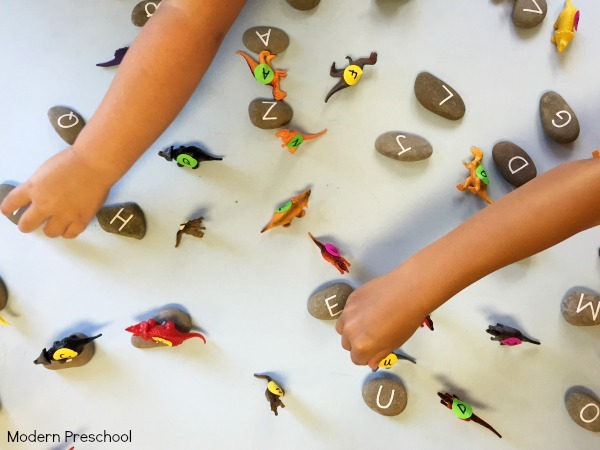 Encourage creative play with the dinosaurs and the rocks too! 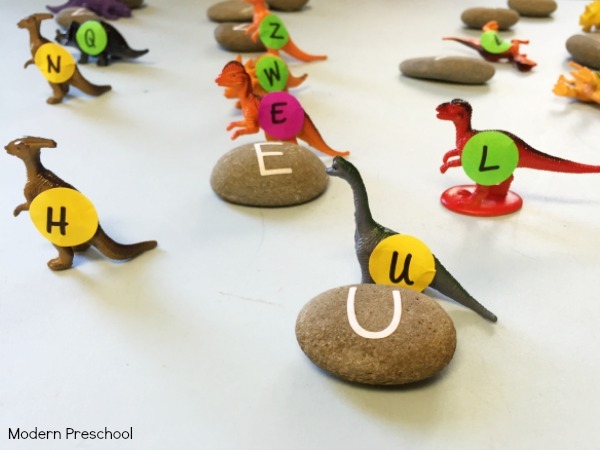 Older kids who have alphabet knowledge can match uppercase letters to uppercase letters on the dinosaurs and the eggs. To add more of a challenge to the activity, add lowercase letters into the game! Write uppercase letters on the rock eggs and lowercase letters on the stickers. Practice letter recognition and matching with this mixed set! My preschoolers love dinosaurs! It’s such a fun theme and the learning activities to go along with dinos is endless! 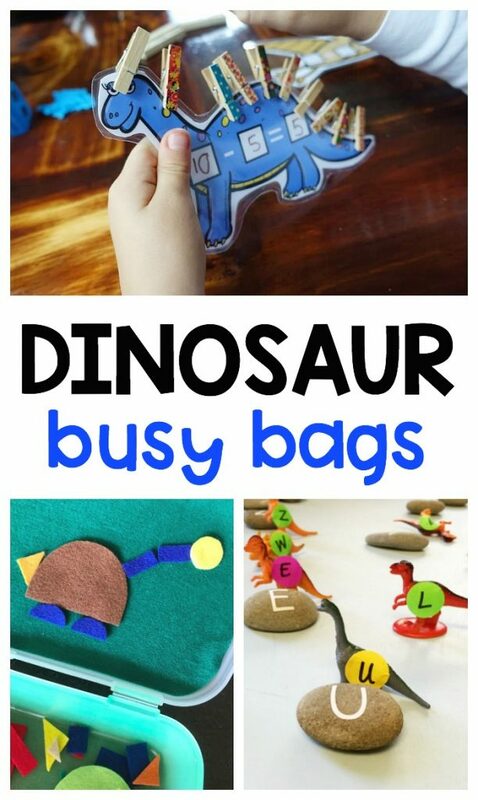 Check out our DINOSAUR LETTER TRACING BUSY BAG and our DINOSAUR STICKER SORT for more learning ideas! Butterfly Alphabet Puzzles Rainbow Alphabet Sensory Bottle Shaving Cream Window Writing Practice Alphabet Flower Letter Writing in Preschool Dramatic Play In Preschool: Welcome to the ABC Market!